John of Whethamstede (died 1465) had an exciting career as abbot of St Albans, a position he held twice. Frequent lawsuits, war and intensive building activity at the monastery formed the backdrop against he wrote histories, an early historical dictionary (the 'Granarium') and corresponded with luminaries of his day. A collection of his letters and historical accounts, this manuscript belonged to the library of St Albans abbey. It was decorated by the same artist(s) who painted the ornament of a copy of his 'Granarium' which is also in the British Library. Along with the letters, the manuscript contains an annals of the abbacy of John of Whethamstede, written by a monk of St Albans, John Agmundishamens. These are full of decrees and decisions because our hero was not shy of litigation. 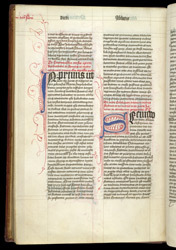 This page has two sections ('First' and 'Second', in large letters) relating to papal decrees on the celebration of the divine office (the daily prayer services of the monks).